A prehistoric cave with remains of 12,000 year old civilization, and a unique grave of a shaman. "Lower Hilazon cave" (or "Hilazon Tachtit") is a small prehistoric cave, where remains of 12,000 year civilization were found in recent excavations. Most notable of these excavations is the grave of a shaman (a tribal witch doctor), a Netufian woman who was buried with animals. This unique cave is therefore nicknamed "the witch's cave", and is one of the earliest known in archaeological record. An aerial map of the area of the cave is seen below. 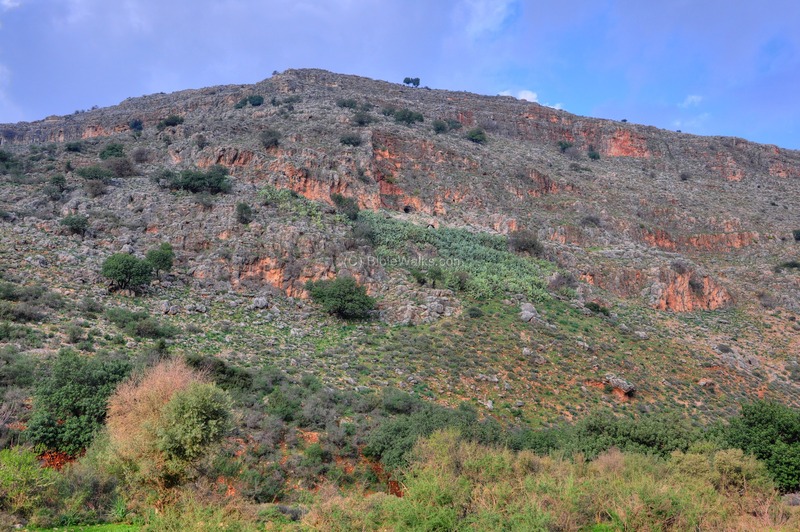 It can be reached from the Karmi'el-Misgav road that crosses the Hilazon valley. A dirt road leads eastwards along the creek to a point under the cave, which is located 120M above the valley. 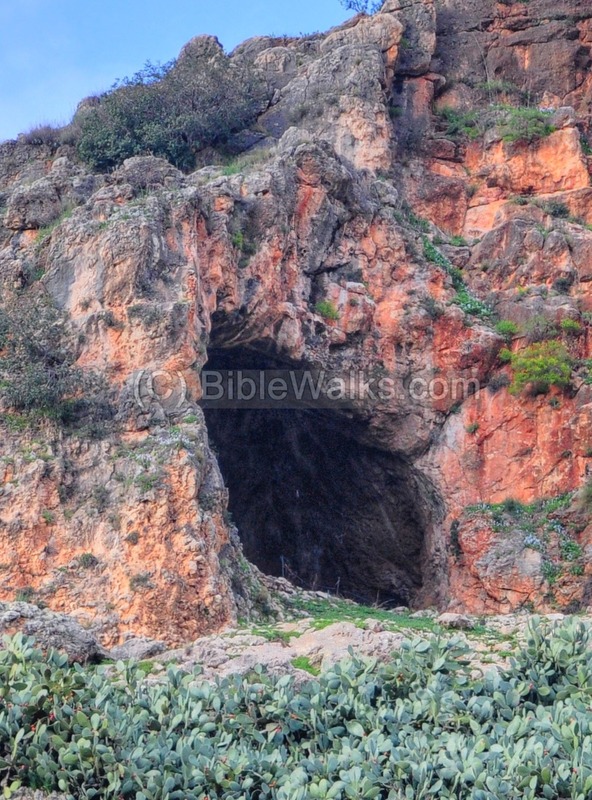 Another cave, "Upper Hilazon" is located 1300M to the east, just under Makosh-hill in Karmi'el. The term "upper" means upstream. In 2008 archaeologists unearthed remains from the Epi-Paleolithic period (16,000 - 8,300 BC) in a cave on the north side of creek. The excavation team was headed by Dr. Leore Grosman of the Institute of Archaeology at the Hebrew University. The remains belong to the Natufian culture (12,000 to 10,000 years ago), at the times of transition from the caves to permanent settlements outside the cave and the beginning of agriculture. These early men were hunters-gatherers, who settled along the Hilazon creek and other sites in the area. In this cave, called the "Lower Hilazon" (Chilazon-Tachtit) cave, the team unearthed a 12,000 year old skeletons of 28 early men, including a woman who was buried with animals and believed to be the grave of a shaman (a tribal witch doctor). The cave, which was was probably used for ritual practices, is therefore nicknamed "the witch's cave". The "witch" was about 45 years old, 150 cm high, and deformed. Her grave was uniquely designed and cared for, a sign of great dignity. She was buried with 50 turtle shells, bones of a leopard, a human adult's foot, boar, cow tail and eagle's wings. These items were carefully arranged during the funeral process. She was the first to be buried in this site. "The Natufians of the southern Levant (15,000–11,500 cal BP) underwent pronounced socioeconomic changes associated with the onset of sedentism and the shift from a foraging to farming lifestyle. 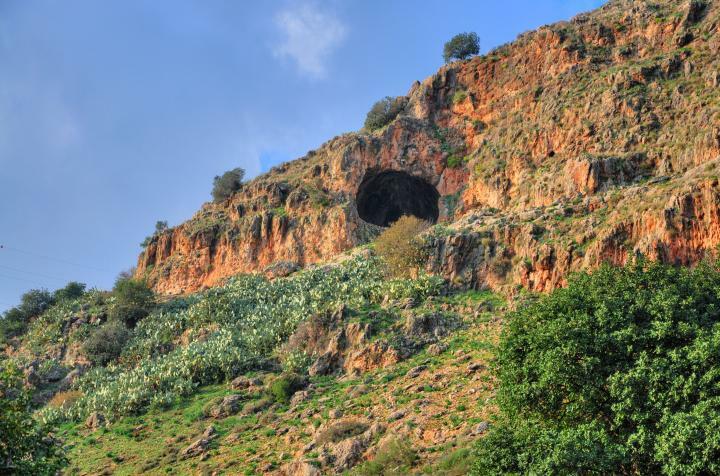 Excavations at the 12,000-year-old Natufian cave site, Hilazon Tachtit (Israel), have revealed a grave that provides a rare opportunity to investigate the ideological shifts that must have accompanied these socioeconomic changes. The grave was constructed and specifically arranged for a petite, elderly, and disabled woman, who was accompanied by exceptional grave offerings. The grave goods comprised 50 complete tortoise shells and select body-parts of a wild boar, an eagle, a cow, a leopard, and two martens, as well as a complete human foot. The interment rituals and the method used to construct and seal the grave suggest that this is the burial of a shaman, one of the earliest known from the archaeological record. Several attributes of this burial later become central in the spiritual arena of human cultures worldwide". The cave can be reached from the valley of Hilazon creek. The lower Hilazon creek is located on the face of the mountain on the north wall of the Hilazon creek. The cave is seen in the photo below in the center of the cliff, above the group of cactus. The cave is located at a height of 120M above the bottom of the Hilazon creek. The entrance of the cave faces the east. There are other openings in this cave. Another view of the cave is in the next picture. 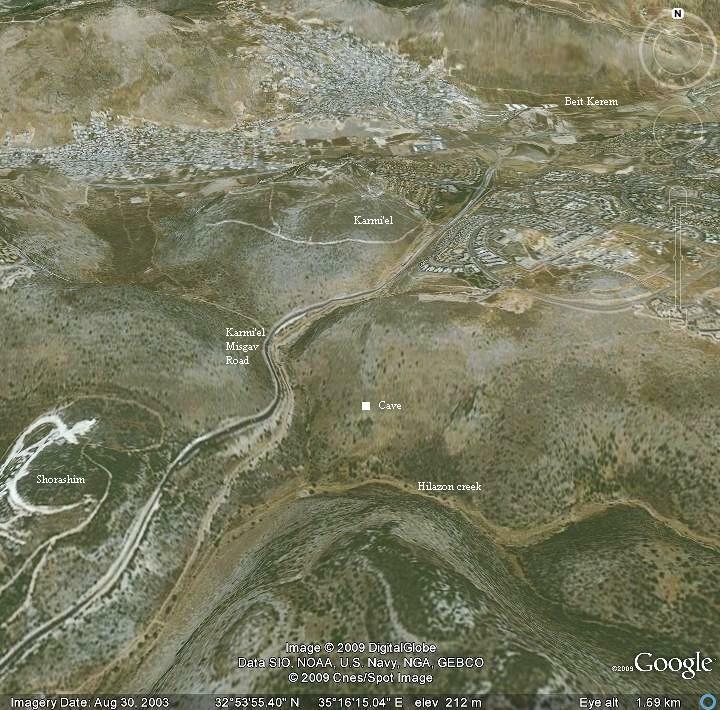 On the left side you can notice the edge of the Karmiel-Misgav road which is built along the face of the cliff. There are other sites from the Natufian period. One of them is open to the public - the Carmel caves nature reserve and visitors center. 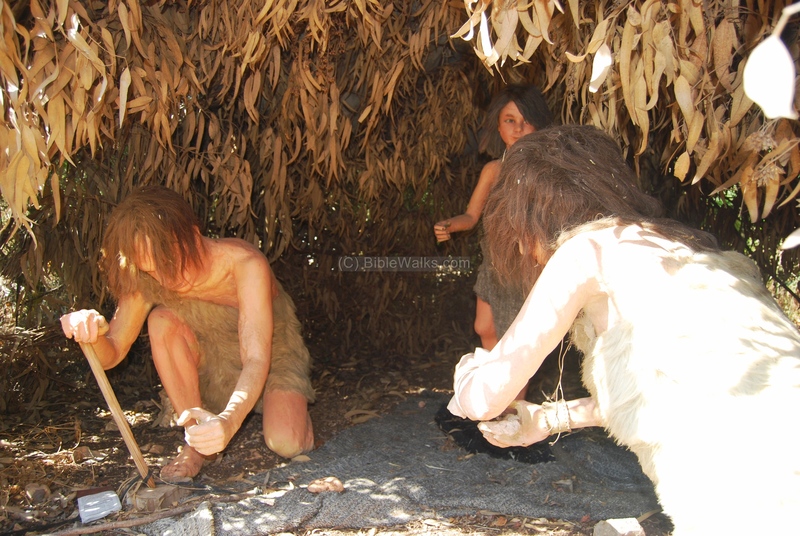 A display of a group of Natufian cavemen is seen in front of the Nahal cave. 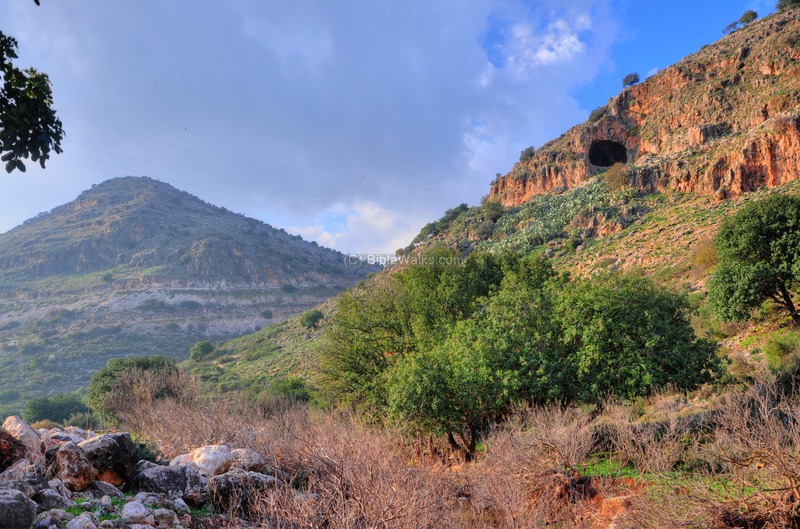 During the period of the Natufian culture these hunter-gatherers built a village on the area in front of the cave. The display shows how they used these makeshift housings for hunting and fruit gathering, and important step for civilization of mankind on its way out from the caves. Pigeons caves - a prehistoric cave nearby; The caves were used for dwellings and burial places for over 50,000 years. Hilazon (Chilazon) - Also known as Mollusc snail, the name of the creek south of Beit-Kerem and Karmi'el. In ancient times the snail was used for producing colors for textiles (purple-blue argaman and sky-blue indigo), which were prized and expensive. Tachtit: Hebrew for: lower (meaning downstream, as opposed to the upper-hilazon cave which is upstream). Epi-Paleolithic- after the "old stone" (Paleolithic) period.